Calgary 4 pm pickup from any downtown Calgary hotel. Ends in Kelowna at noon on day 9, drop off at Kelowna Airport, bus station or any hotel. Welcome aboard the ultimate guided winter road trip in Canada. This is your chance to explore some of the best of our mountain playground with a genuine local guide to make sure you hit the best gems and stashes along the way. Over the course of nine days you will not just ski or board your legs off at four of Canada’s top winter resorts, but will also soak in secluded hot springs, taste craft beers and local wine, mingle with locals, and dine in the best restaurants in each town. This is a small group ski/ snowboard tour which means that you can expect an ultra smooth experience and no coach bus hassle. During your tour you will experience the virtually limitless terrain of four of Canada’s most iconic ski resorts. Feast your eyes on world class vistas in the Rockies. 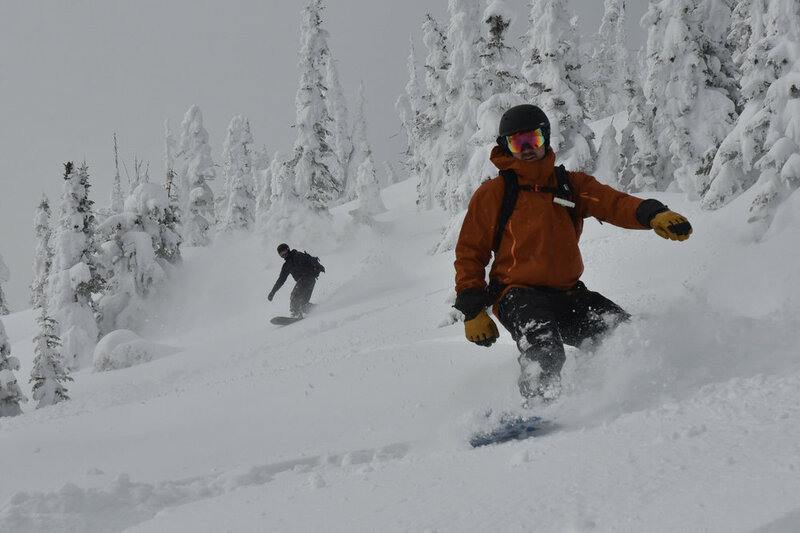 Challenge your legs on the steeps of Kicking Horse which has more expert terrain than practically anywhere, and immerse yourself in a blissful world of powder and wilderness in the bowls of Revelstoke. By taking a guided tour you can explore more mountains on a single trip and the best part is that we take care of everything for you so your dream trip is planned to perfection after a single email. It has taken us over ten years to find some of the secret gems on this ski tour, and you get to experience them on your first day with us. This tour is perfect for you if you want more than an ordinary ski vacation and see yourself getting off the beaten path for a real adventure. You will be exploring both the Rockies and the Powder Highway, both known for impressive mountain ranges and dependable snowfall year after year. The terrain at each resort is suitable for all levels of skiers and snowboarders, or opt out of lift tickets and turn this into a perfect winter getaway for non skiers. We can help you arrange dog sledding, snowshoeing, xc skiing, scenic gondola rides, fat biking, ski/ snowboard lessons, heli and cat skiing as well as some relaxing spa days. 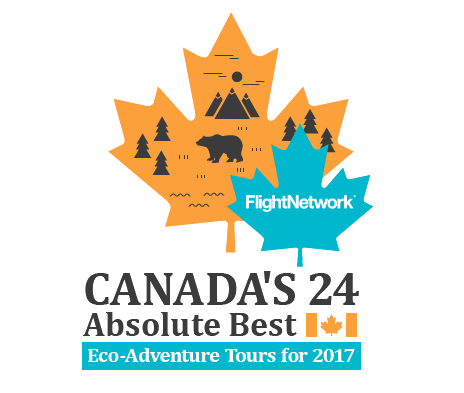 Drop us a line to start planning your ultimate ski/ snowboard tour in Canada. We are looking forward to riding with you soon! Day 2- Feast on a delicious breakfast at a cafe before hitting the slopes with your local guide today. We spend the day skiing and boarding at Lake Louise which has tons of terrain for every level of skier and boarder. Find your legs on some mellow groomers with spectacular views of the Lake, Victoria Glacier and Chateau Lake Louise across the valley or challenge yourself on some steeper runs in the back bowl with your guide. Finish off the day with some apres drinks and a gourmet meal, chatting with your new friends about how sick you all were on the slopes earlier. Day 3- Try another cafe and head up for a day of exploring the alpine playground of Sunshine Village, rated one of the best freeride resorts in Canada and with a buffet of mountain vistas in all directions. If you're feeling chill, there are some amazing cruisers, heated chairlifts, patios and panoramas everywhere you look. If you're feeling adventurous, dive into some more intense terrain with your guide, picking off some of the best runs on the mountain with enough spines and steeps to keep your knees knocking and your heart pounding. Feel free to ask your guide for some pointers to take your riding to the next level anytime! After another animated group meal we head over to Sulphur Mountain Hot Springs so you can rest those legs in style, soaking in the same healing waters that the First Nations travelled to for thousands of years. If you feel your legs have been sculpted well enough by the day's skiing you can rent a traditional unitard-style bathing suit and show it off! (Encouraged but never recommended). Day 4- You guessed it! Another day of tearing it up on the slopes at Lake Louise or Sunshine (depending on conditions), with the option to head up for some solo laps to nearby Norquay, which is pretty much on top of Banff Avenue. Enjoy another meal at one of Banff's most historic restaurants and take a dip in the steamy grotto hot tub of your hotel. Day 5- Today we hit the road, heading through Banff and Yoho National Parks, seeing for ourselves why the First Nations named the area after the feeling of awe they felt. We arrive at Kicking Horse Mountain Resort, located right between the Columbia Mountains and the Rockies. If we were here 150 million years ago we would be on a beach, but thanks to some plate shifting we now get to ski one of the most epic ski areas in North America. Kicking Horse is home to.... well, after 10 years I don't even know how many chutes and I still keep finding more, as well as 4 unbelievably sweet alpine bowls. Take the gondola up and pick your poison on the way down, heading for scenic cruisers that last forever or fast forward a bit and point it down a steeper run with the help of your guide. Top it off with a drink in Canada's most elevated dining experience (Eagle's Eye Restaurant), a succulent meal in one of Golden's best restaurants and a soak in the tub and you get a pretty amazing day. Day 6- If you can even climb out of bed today then you might as well head up to Kicking Horse for another round of 4000 vertical foot, scenery so distracting you can barely ski, champagne powder so light it's blowing in your face kind of runs with your guide, who will probably have a ridiculous grin stuck on his or her face at this point. If you're up for it we hike as a group to some of the lesser known runs on the mountain, which give you access to a massive powder field and a whole bunch more heli-ski worthy runs. (Unlike a heli-ski run, these ones actually have a heli-lodge worthy bar waiting for you at the bottom. Grab another classic mountain meal in one of the first log cabins built in Golden before sleeping like a baby. Day 7- Soak in some more scenery as we journey through Rogers Pass, known for the 140 avalanche paths that have plagued the highway and railway for over a century. Here we witness the struggle between mankind and the mountains and then we experience it for ourselves as we try to ride every tree run and bowl at Revelstoke Mountain Resort. Enjoy the longest run (Last Spike), which passes 3 glorious warming huts, all complete with coffee, tea and warm “adult beverages”, or follow your masochistic guide up the bootpack to subpeak for some full bowl runs that you can't help but feel giddy on. Drop in and ski three sections of open bowl and several pitches of tree runs, finding out for yourself that Revelstoke has the highest vertical drop in North America. Check into your hotel for a good hot tub recovery session, before trying the food of Revelstoke's best rated restaurant. Day 8- One last day to enjoy Revelstoke Mountain Resort so make it count! Assuming we barely scratched the surface the day before we will do our best to explore the rest of the several thousand acres of tranquil tree runs, craggy ridges and open bowls. Enjoy the views, the friendly locals and the unrivalled terrain with your guide before having a celebratory drink, well deserved after the 5400 vertical feet you rode down to get to the bar. Tonight we head to another set of hot springs across the lake, taking a unique ferry to get to them. Treat your muscles to a relaxing soak before we feast on the gourmet dishes of Kingfisher Restaurant and recount the highlights of the trip. Day 9- This morning we head to the best cafe in town for breakfast before hitting the road to Kelowna. 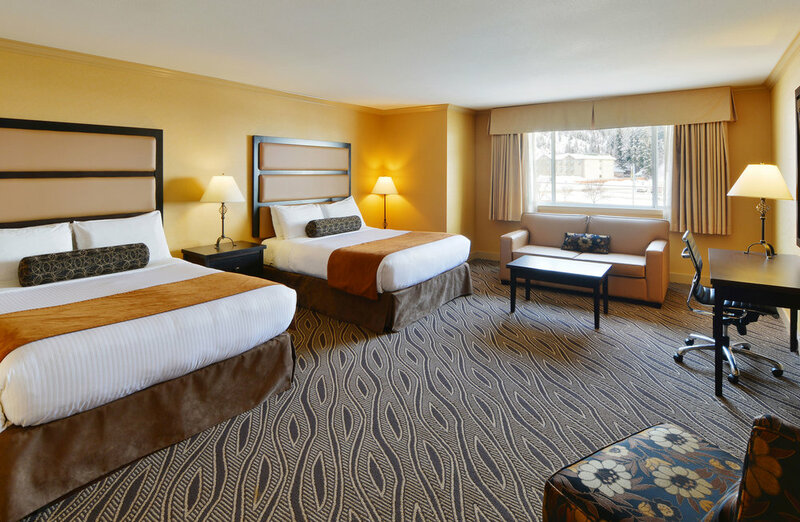 We will drop you off around noon at the airport, bus station or any hotel in Kelowna. You should be safe to book a flight out of Kelowna airport by 3 pm today. Hopefully some of you will be continuing on for the second half of the Ultimate Powder Highway Roadtrip with us to explore the hidden gems of Red Mountain, Whitewater, and Fernie. See you soon! 8 days guided skiing/ snowboarding, 3 hot springs, 4 Canadian ski towns. Revelstoke, Kicking Horse, Whitewater, Red Mountain. 6 days guided skiing/ snowboarding in the Kootenays. Hot springs and 3 rustic mountain towns. Red Mountain, Whitewater and Fernie. 4 days guided skiing/ snowboarding. Two hot springs, 3 Canadian ski towns. Epic terrain at Revelstoke and Kicking Horse.